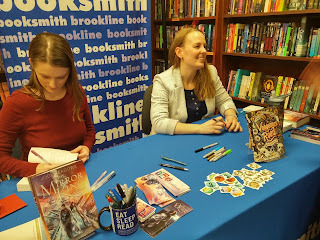 So last night I went to an amazing book signing with Jodi Meadows and Erin Bowman at the Brookline booksmith bookshop! Here is a SUPER LONG recap of everything the talked about! 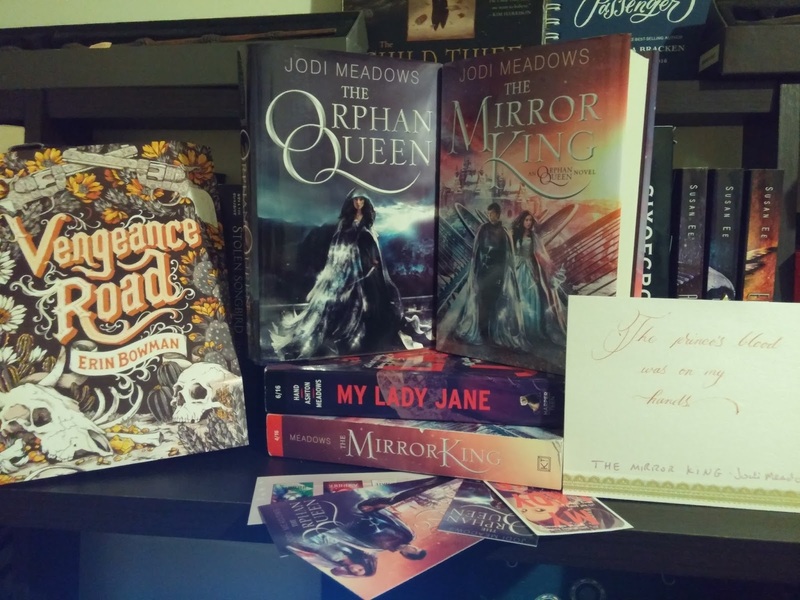 They described their books, and when Jodi started talking about The Mirror King she kept saying that everyone hated her after they read it! Even her editor and agent. Erin told her hes not pitching her book well so Jodi said there was kissing and it was fine. Erin read Jodi's blurb off the back of her book. So cute! Erin's inspiration for each book is always different. Usually voice came first. But vengeance road is written because of the legend of the gold in the mountains in Arizona. lost Dutchman. Muse explosion! Jodi's inspiration for Orphan Queen came when she was watching super hero cartoons. A minor scene of a girl saving a boy from her own people turned into when Tobias and Wil were kids. Then thought about magic and destruction! 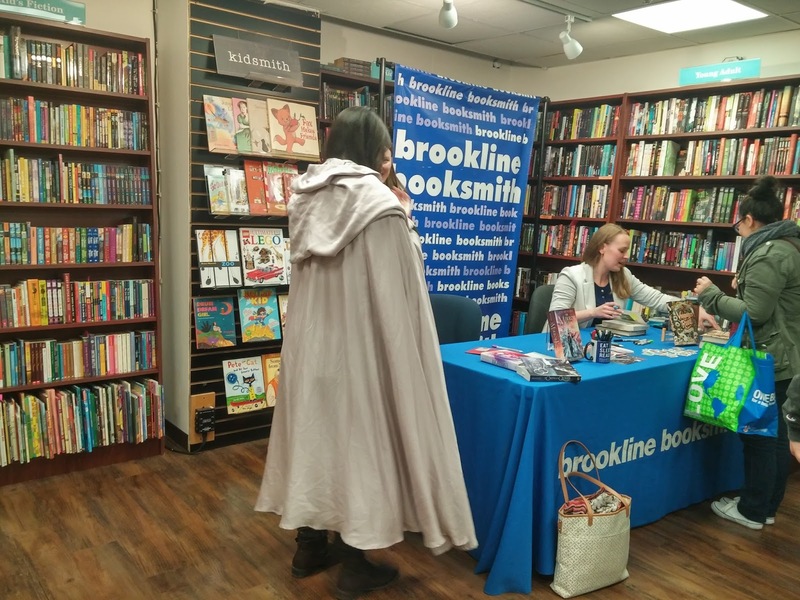 Jodi said she added the characters in cloaks in the second book because the cover of Orphan Queen and Mirror King had cloaks. So she felt she should. For her first series, Asunder, she told them not to put a face on the cover... and... they did anyway. For Orphan queen. They asked what she'd like and she said maybe a girl with a weapon? In a pretty dress because Harper likes pretty dresses? And surprise! They did! Then they asked if she wanted a boy on MK's cover and they did! She was pleasantly surprised. Erin had a pinterest board she shared with her Eritor and they came across this illustration styled card that they both loved. They both said it was really cool when you see someones vision of your work. The ultimate fan art. Jodi looked into calligraphy and forgery. (For fiction strictly. Of course.) Several hundred dollars later she ended up with a hobby in calligraphy. Erin had to do a lot of research on the legend of the Dutchman's treasure and historical references of Arizona. She also traveled to Arizona.... in June...while pregnant! So she has lots of respect for the characters who couldn't go back to a hotel room at noon like she did. Maps. Do you sketch them and give them to an artists? Jodi traced Virginia over her computer monitor! She loves the valley and really wanted it in there. So she was also really picky about how high they were on the drafts. If your book was a Taylor swift song which? Jodi: I also pick trouble! Jodi: I also pick that one! She had told her editor: I have an idea for a novella. Editor: How many are you willing to write? Jodi: How many are you willing to give? Editor: Lemme get back to you. Four. Jodi: Then I will write four. Jodi was asked about Lady Jane. 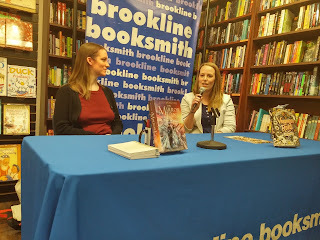 She talked about the giant nerd and awesome-sauce book girl and emphasized that in their book she does NOT lose her head. 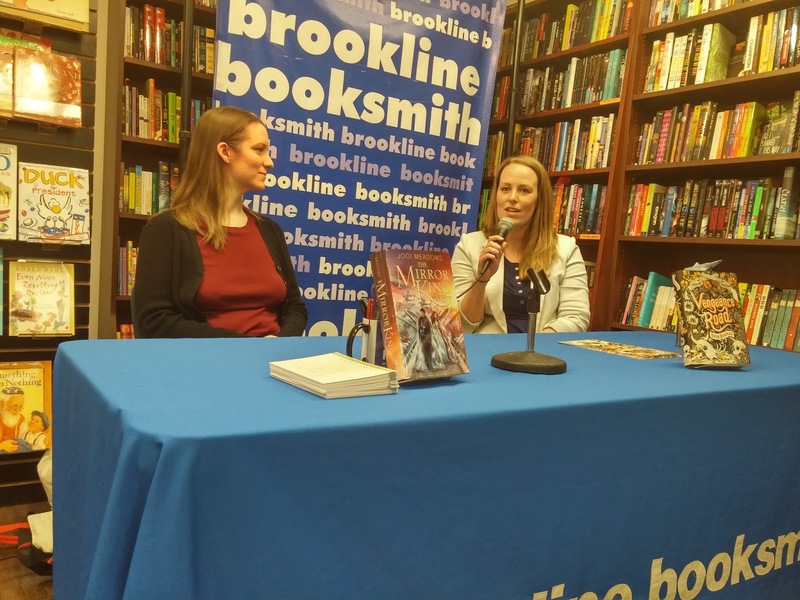 Writing the book with the other authors was so easy for Jodi. For a week they'd write a chap a day and then read it together and wouldn't want to disappoint each bother. Erin is working on retribution road and a short story in an anthology.The second A Tyranny of Petticoats Anthology. Jodi is working on cell story with illegal dragon trafficking. And with the Jannies other book. Jodi's characters always come fully formed. Sometimes her characters are like her friends so shell think "what would --do?" Erin's characters gray and brother are inspired by her and her sister. And how they interact. They don't dream cast their books. They like it when readers do though. Jodi inspired someone to knit a sock on the plane on her way here. Do you write in bursts? Jodi: It's different for every book. I will drop everything for those bursts. (Reward them for good behavior.) OQ was that and MK was the opposite. Erin has a structured schedule. Because of her baby. Has a nanny and does the bulk of her writing then. She hates writing middles! She always has a good flow in the beginning and end. But middle is a muddy desert of badness. Whats harder, perfect first lines or last lines? Jodi: I cheat. My first lines and last lines are similar. 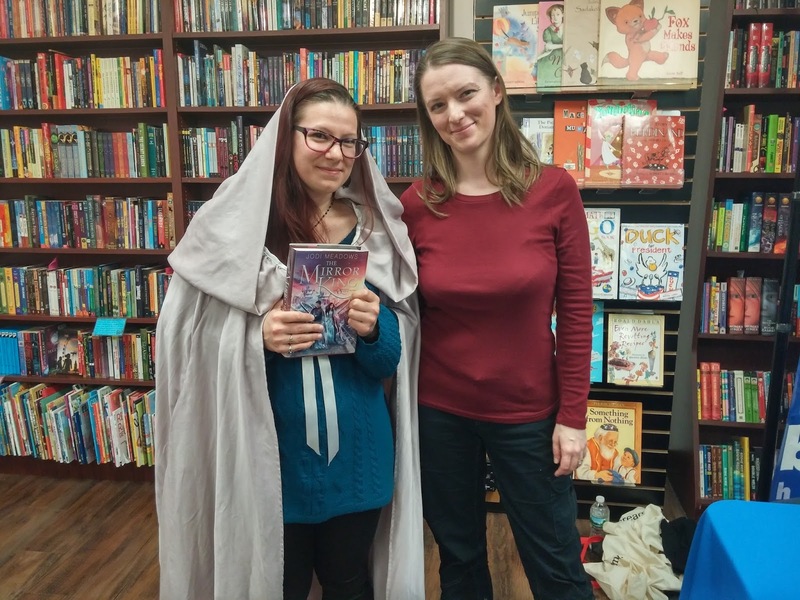 (everyone grabbed their Jodi Meadows books and exclaimed at the awesomeness of it all!) Orphan Queen's first line she loved but it didn't work and she had to fix it. Erin has an easier time with beginnings than ending. Very first line of vengeance road never changed. Erin said there was a scene in frozen that her editor told her to get rid of that she loved. Erin left it in and completely ignored her editor. And her editor noticed and told her again. And she finally pulled it out the in the very last revision when her editor didn't comment on it for the first time.She knew it was better for it. But it's so hard to kill the darlings! Jodi says when they draft is like ruts and it it feels solid and hard to delete or change. It hurts the soul to change things. Erin love villains to friends to lovers. 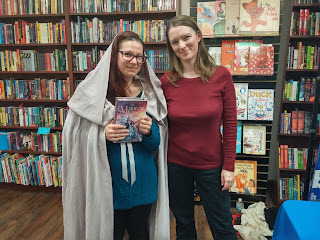 I was so happy and surprised that Erin Bowman remembered me from her Ladies Living Dangerously Signing back in September. Erin and Jodi are so incredibly nice and fun and funny. I love them on panel together. 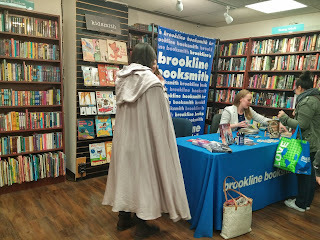 Jodi Brought the cloak she made off of the cloak on The Orphan Queen cover and let everyone put it on and take pictures! Of course I had to try it on!